portion control plates, manage how much you eat. Portion Control Plates, Help manage What You Eat. What are portion control plates? These plates are used to control the amount of food you eat whether it be breakfast, lunch, or dinner. Many restaurants and individual homes have incorporated this way of eating to control the amount of food that goes on a plate. Eating with portion plates are used also by people who are dieting, which helps them to manage how much they consume. I will have you to know that these control plates are only use wisely if you know what to put on them. You can put both healthy and unhealthy food. It is indicative to understand that portion plates were design with health in mind, and it would be defeating the purpose of health if junk food is used as portions on these plates. Portion plates help you to stop over eating, this will help the stomach to feel relax and not bloated. Normally when I eat, it's a small portion without a control plate, because over the years of monitoring what I eat and how much, my plate is well proportion for metabolic comfort. What needs to be on your portion control plates are foods which are nutritious, balanced, and that are good for food combination. For proper usage of these plates, use plates which measure the right amount of food recommended for you. Fruits and vegetables should be half your plate , half your grains should be whole grains, and your protein food choices should vary. This is a simple healthy food guide for a proper daily recommended amount. 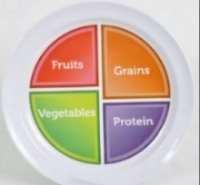 Get plates that are divided in four sections, and add the four food groups; fruits, vegetables, grains, and protein to your plate and fulfill the true purpose of what these control plates were design for.